• A medical report or brief explanation of the current medical problem. 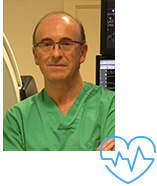 Dr Antonio Asso graduated from University of Zaragoza medical school and trained in Cardiology at Hospital XII Octubre in Madrid. After a 2-year fellowship in cardiac electrophysiology at University of Minnesota returned to Fundación Jimenez Diaz in Madrid. His phD (doctoral thesis) obtained in 2005 with the study: “Characterization of unipolar and bipolar electrograms and its relation to outcome during catheter ablation of accessory pathways. 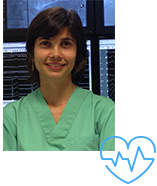 Dra Naiara Calvo graduated from University of Pais Vasco medical school and trained in Cardiology at Hospital Clinic in Barcelona. She was an Arrhythmia fellow in this Center and completed her training in Netherlands, London and then worked as staff member of the Arrhythmia Unit of Clinica Universitaria de Navarra.